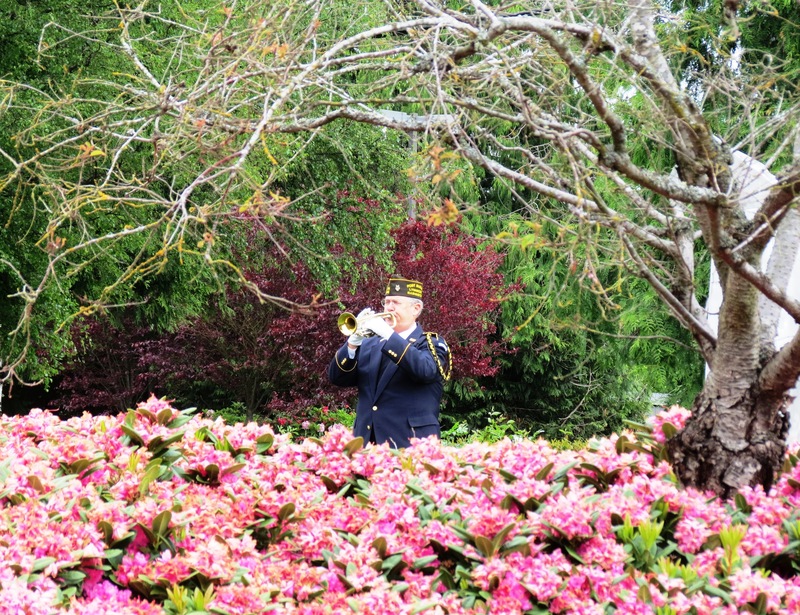 Clearly, someone carefully chose the rhododendron species at Veterans Park in Lynnwood where the Memorial Day ceremony was held on Monday, 28 May—the dark pink flowers were still in full bloom as two wreaths were laid in honor of those American military men and women who died during our wars. 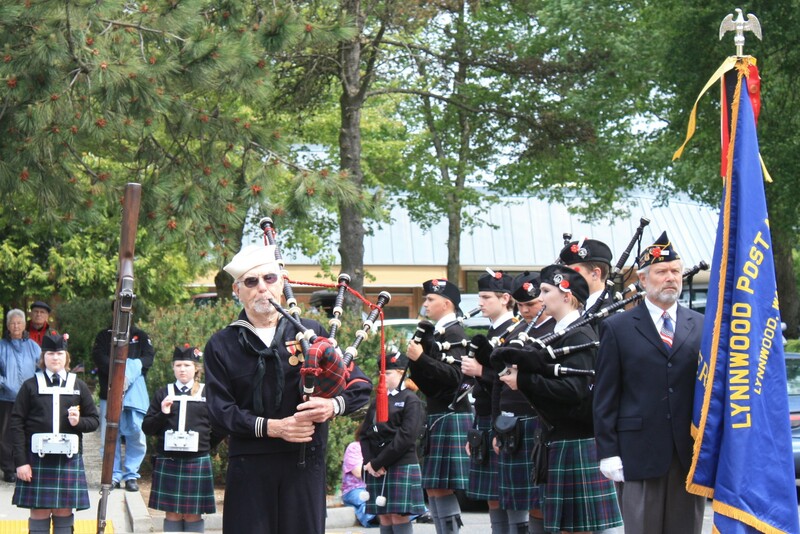 Martin Spani, Commander of Post 1040 of the Veterans of Foreign Wars (VFW), Lynnwood, emceed the ceremony which featured the Northwest Junior Pipe Band, singer Garret Lloyd King, and guest speaker, Lt. Col. Joseph S. Jimenez, U.S. Army (Ret.). The memorial wreaths were laid by Richard Larson, USN, WWII, of Lynnwood American Legion Post 37, and Art Clemente, USMC, WWII, Lynnwood VFW Post 1040. Boy Scouts of America, Lynnwood Troup 49, assisted by placing the flags in the park and distributing the programs. A crowd of almost 225 attended under an overcast sky. The pipe band played “Green Hills,” “Battles Ore,” and “Amazing Grace.” Ray Colby, a Navy World War II veteran and the VFW Post 1040 piper, played “God Bless America.” After the rifle salute by the VFW Post 1040 Honor Guard, the post bugler (me) sounded “Taps.” Throughout the ceremony, the American flag flew at half-mast. At twelve noon, I played the bugle call, “To the Color,” as the flag was hoisted to full-mast by the post’s Color Guard. This entry was posted on June 2, 2012 at 12:10 pm	and is filed under Ceremonies & Celebrations. Tagged: American Legion, bugle, bugler, Honor Guard, Joseph S. Jimenez, Memorial Day, NW Junior, pipe band, piper, Taps, To the Color, U.S. Corps of Chaplains, USCOC, Veterans of Foreign Wars, Veterans Park, VFW. You can follow any responses to this entry through the RSS 2.0 feed. You can leave a response, or trackback from your own site.